Back to school means cooking for myself again. I've been pinning all kinds of recipes to my "yum" board in preparation. This one was first on my list. This lovely recipe is from the Big Red Kitchen. There's only two ingredients. That's right, just the cake mix and the pumpkin (15 oz.). No oil, no eggs, no water, nothing else. The end result is an amazing, incredibly moist muffin/cupcake with a hint of pumpkin flavor. It felt kind of strange not to add any liquids to the mix but it came together nicely into a thick batter. Bake at 350 degrees for 20-25 minutes. Add a dusting of powdered sugar, or better yet some homemade cream cheese frosting for added awesomeness. Made these with chocolate mix too. Read about how they turned out and other ways to alter this recipe here. That's the really popular weight watchers recipe. A very low point treat! Delicious! But wait, pumpkin in a can... Love it. Want it. But damn, live in Australia & we don't have it! I totally just made this this morning. I was having a crazy pregnancy craving, was reading this in bed at 6:30, ran out the door in my sweats to grab the ingredients, and had an embarrassing incident in the process. I saw these on hungry girl with a devil's food cake mix and made them last night. They were delish AND I substituted a gluten free cake mix so my whole family could enjoy them. SO EASY!!! LOVE this recipe-we use a spice cake mix for extra yumminess. These look delicious! I really really love pumpkin muffins. This recipe looks so easy, I know I'll have to try it this fall. Again, YUM! Thanks for sharing with Crazy Sweet Tuesdays! These look awesome...and so easy! Cannot wait to try. I use spice cake mix and throw in some chocolate chips -- spoon it onto a cookie sheet and call them cookies. Not quite as good as my pumpkin chocolate chip cookies that have 42 ingredients and take two hours to make (okay, I exaggerate), but they're close. My boys' favorite cookie! Love your site. Thanks so much for the link love! I must make these again and will try a chocolate cake mix for my kiddos. 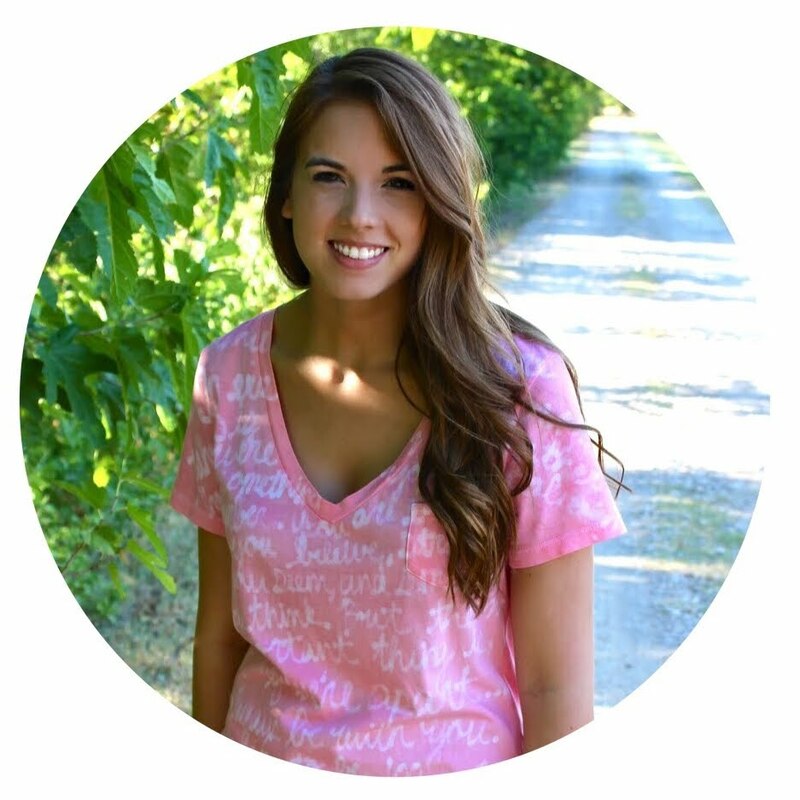 You blog is great and I love your game day dress- very posh indeed! Don't be afraid to try selling them, you never know until you try. Start small with only a few dresses and see how it goes! Hey! I saw this on pinterest and tried it out! I added chocolate chips too! It was so good! Thank you for sharring, now I finally know what to do with all those cans of pumpkin pie filling that have been sitting in my cupboard! Yum. Made these for dessert - my kids flipped out for them. And so perfect to stick in their school lunch. I LOVE your blog! Saw these on pinterest as well and will be trying them this morning! :) I was curious where you found your cupcake/muffin liners? I've never seen any quite like that but love them! Thank you for all your kind words ladies! I found the baking cups at Hobby Lobby in the cake decorating aisle. They're Wilton's brand ruffled baking cups. I'm going to try this recipe tonight! Thanks! Curious...how many muffins does this recipe make? A full dozen? @Amy who used Gluten Free mix...I assume they turned out ok? I was going to ask if anyone had used a gluten free batter. Going to make these this weekend! I am about to try it with a white cake mix that is gluten free. It's what I had on hand, so I can post later how it goes. I have been seeing these on pinterest and even repinned them a while ago so now that the weather has turned cool, I pulled out the pumpkin and a cake mix to try them. Thanks for sharing. Made these yesterday. Pretty good but didn't taste enough like pumpkin for me. So I added some spices this morning. Some cinnamon, nutmeg, a little bit of ginger and ground cloves. It made a huge difference in the flavor! Gave you a shout out on our blog today: 3flygirlz.blogspot.com. Saw this on Pinterest, so came to visit. Thanks for sharing! P.S. Love your idea of adding powdered sugar or frosting too! Just made these tonight using white gluten free cake mix (Betty Crocker, I think) and it turned out well (I also added some pumpkin pie spice) and I made it as a cake instead of muffins/cupcakes. It's still kind of doughy in spots but I guess that's okay since it's just pumpkin and not egg. The edges were very done, though. I can taste a bit of the gluten free aftertaste but it's not horrible. I mixed it Pillsbury vanilla frosting (also gluten free) and made cake balls, and dipped in Lindt white chocolate. Overall, I think it's very good and adds something to the gluten free cake mix. Next time I'll make into muffins or cupcakes. Thanks for posting this recipe! What size can of pumpkin? All I could find was a 30oz can but the picture looks to be a smaller can. found this recipe on pinterest and just tried it out. these are super easy to make and super yummy! I used a 15 oz can. I'll add that info to the post, thanks for reminding me! I also found this on Pinterest and had to make them. Used Spice cake and Sweet Potato pie filling because my grocery didn't have pumpkin pie filling (I know, right!!??!!) They were SPECTACULAR!! I made them in a mine muffin pan (24 mini muffins). Took only about 10-12 minutes rather than the 20-25. Also, the sweet potato filling can was 30 oz and I saw the recipe called for 15 oz so I just used 1/2 of the can of sweet potato filling. These were so yummy!!! I just found this yummy looking recipe.. how easy too.Im going to make it this weekend when we have our very first frost. Im a new follower.Im loving this blog! Wow these look amazing! I can't wait to try them! Thanks for sharing! Oh my goodness, On the way home tonight, I told my sister, man I could go for some Pumpkin pancakes from IHOP but being preggo and tired with swollen feet did not feel like going. Got on pinterest to show my sis how it worked and saw a pin of this recipe!! It is SOO good. We went a little to heavy on the icing by mistake but the cupcakes were awesome and so easy to make!! I just made these tonight for our Worship Leader! I made one with yellow cake and caramel bits, and one with spice cake mix. I added pumpkin pie spice to both. I will sprinkle the caramel ones with pdrd sugar and cinnamon, and the other I might do with cream chees mixed with whipped white frosting from a can... I know, more cheating. My next batch I will make a cream cheese and pdrd sugar frosting, roll it into a log and chill it. Fill the cup a third full, add a slice of chilled frosting and the rest of the batter. It makes a nice cream cheese surprise! Make sure you let them cool, because the filling gets screamin' hot! Yum! They are perfect! Thank you for this great and simple recipe!!! Thank you for sharing! Perfect for this weekend!!! Amazing! I made them with spice cake and did throw in two eggs and some oil for some added fluffiness. I added some buttercream frosting, green and orange sprinkles and a little pumpkin candy on top. They were a huge hit...just as good, if not better then anything from a bakery. I made see using a Carrot Cake mix and added raisins. Unbelievably delicious. I let them cool about 10 minutes then popped them into a gallon size zip lock bag which kept them very moist. What a great recipe. I'm going to experiment with a few other cake flavors. This looks so wonderful and yes, easy! Thanks for sharing, I must try it. I got this recipe through Pinterest as well. Today I went and bought all (okay, both) the ingredients and the muffins are in the oven even as we speak. I am going to mix up some vanilla pudding, add a little sugar free pumpkin pie syrup (torani) and see if I can put some in the middle of a few of them. Love them! Thanks for sharing the recipe! I have a friend who makes these and she adds Hershey's cinnamon chips to the mixture. This adds the extra flavor. The cinnamon chips are a seasonal item that can be hard to find. I found this recipe through Pinterest and gave it a try tonight since I had the ingredients on hand. They blew away my expectations! My hubby, both kiddos and I loved them. I added some chocolate chips to the mix. THANKS for sharing! I am going to make these today! Thanks so much for posting this! Made these this morning with my 2 year old. I also threw in some milled flax seed for a little extra healthy kick. Had a hard time making them though because he wouldn't stop eating the batter! Then he preceded to eat two muffins, and got mad when I wouldn't let him eat a third. These passed the toddler test, and that's saying a lot at our house. I tried these for my writer's group and they were a huge hit. I often joke how I require 'easy and quick' cooking due to the number of kitchen disasters I have, and this idea was PERFECT! I love that this recipe is only two ingredients! So easy and sooo good! Thanks for sharing! I may be the only person who did not like this recipe. However, it may be the cake mix I used. The fake vanilla taste of the yellow cake did not jive well with the pumpkin flavor for me. I may enjoy with spicke cake or white cake mix instead. If you are going to use Gluten Free cake mix (like us) add one small box of dry (the powder kind)sugar free vanilla pudding. This will add tons of moisture and you will not have a dry/dense muffin! I think I will make these into birthday cake for my 1 year-old with layers and yummy, fluffy cream cheese frosting. Any reason that wouldn't work? Yum! I just read about this on my friend's fb page. Easy and delicious sounds perfect! Mine are in the oven right now! I used the pumpkin filling with the pie spices in it already (Libby's Easy Pumpkin Filling), butter golden cake, and CHOCOLATE CHIPS. This recipe is already a winner. The leftover batter was awesome. Wow~ thank you so much. I needed a quick recipe for a party I'm throwing for a few of my son's friends tomorrow and I just happened to have these ingredients. They are SOO yummy. Thanks for saving my Halloween! Made these over the weekend with carrot cake mix and they were amazing! Thanks! Lifted this recipe from Pinterest and am always looking for extremely easy foodie ideas. I made this today and it was incredible! Made a creme cheese frosting and subbed pumpkin spice butter along with the vanilla and conf sugar. Heavenly! ! ! Thank you so much! Has any one tried these with fresh pumpkin? I have a bunch left over from the pumpkin pies I made for Thanksgiving, and i'm looking for an easy (and delicious) way to use it up! I made these this week for the first time with a spice cake mix. I added chopped walnuts and chocolate chips and my children love them! Going to try them with raisins next. My son loves them for breakfast! I made these with spice cake mix, chocolate chips, leftover FRESH pumpkin purée, and a little extra pumpkin pie spice. Delicious! Hi! Found your blog, and specifically this recipe from a pin on Pinterest! Love the recipe and blogged about it today as a simple, holiday baked good and gift idea. I linked your original blog post. Thanks for sharing! I found your post on Pinterest and I'm sooo glad I did!! These are just sooo darn yummy!! I made my first batch of these today and they're delicious!! I even used white cake mix instead of yellow and it turned out amazing!! Thanks sooo very much for sharing!! Anyone know the WW points value on these? I'm featuring this post over at Lisa's Craft Blog later today!! Feel free to come by and grab a "Featured" button whenever you're ready!! Thanks for sharing such a great recipe!! I just came across this post today...I made these a few weeks ago after learning about them in the M.O.M.S. group I'm in. They are so wonderful!!! I'm surprised no one has commented about using pureed pumpkin instead of the canned pumpkin. I have a freezer full of pureed pumpkin from the fall. I'll put 15 ounces or so of that plus spices and I'll probably through in some dried blueberries. I have a vegan spice cake mix that I've been wanting to use, so I'm excited to try it. Has anyone tried making them with yams or sweet potatoes. And adding the cinnamon and nutmeg to the batter maybe. I am going to give them a try. Hubby does not like pumpkin. Let's ya know how they are. Thanks for the tip. With Cloud Nine, thousands of expert surfers and tourists all more than the globe flock to Siargao to witness its annual International Surfing Contest which generally commences on September and is sponsored by the neighborhood government of Surigao Del Norte. For enthusiastic surfers on the market, the surfing season begins on September and lasts till March. But even then, one can nevertheless catch those monster waves any time in the year. Bought all the ingredients for this last night (didn't have a cake mix) and so excited to try it! Thanks for sharing! About how many calories do you think are in one muffin? Just wondering! They look delicious! I made this tonight!! Boy oh boy good stuff. I used Betty Crockers carrot cake mix and the 15oz pumpkin, some pumpkin pie spice added chocolate chjps to only some muffins. Sprayed 36 mini muffins tin cups. My family enjoyed the ones without the ch.chips except for my chocolate lover daughter :) Thank you for sharing. for those of you who put spices into the mix, how much did you use? And how many muffins did this make? Thank you..they sound awesome! How many points is it per muffin, using a dozen muffin tin? Cannot wait to try this because I oh so love pumpkin & easy! I made these today but i did not know how many it actually made so i ended with 15. I keep seeing psts that say it makes 24. so I put in on my ww site and it came up with 4 pp per muffin. so next time i will make 24 equal muffins for the less points. Can I add some soy protein powder or will it be to thick? Do you know about how many calories per muffin? I just popped these in the oven. I added a tablespoon of pumpkin pie spice. Let's hope it works! Has anyone made this with sugar-free cake mix? Pillsbury has sugar-free vanilla and devil's food chocolate. Anyone know if you can use Pumpkin PIE mix instead of just Pumpkin? Here Is A Cool Tip: I Put The Cake Mix In A Ziploc Bag Along With The Pumpkin And I Mush It All Together Then I Cut A Slit In The Bottom Of The Bag In The Corner And BAM! No Mess No Bowls!! I Love This Recipe!! 100% pumpkin pie filling or pumpkin pie mix with sweetener already in it ? Hi! Just tried these from Pinterest.. Delish.. I used a spice cake mix and added some cinnamon. Also, mine only took about 19 minutes, but that could be my oven.. Thanks! OH MY! MY HOUSE SMELLS AWESOME! I MADE THE CARROT CAKE MUFFINS EVEN THOUGH I COULD NOT FIND MY MUFFIN PANS 8( BUT I COULD NOT TURN BACK NOW,SO I PUT THEM IN THE LINERS IN 13 BY 9 PAN & THE LEFTOVER BATTER I PUT IN LIL FOIL PAN.THE BATTER TASTED DELISH 8} IT IS BREAKFAST TIME HERE IN EAST TENNESSEE & AM GONNA SURPRISE MY GBABIES WITH THESE WARM,SCRUMPTIOUS TREATS! WHO KNOWS I MAY WIN THE BEST NANA AWARD! THANX FOR THE RECIPE.. WILL LET YOU KNOW HOW THEY LIKED THEM! I just made these! Added some semi-sweet chocolate chips. They were amazing! So fluffy and yummy. Definitely making again! I used the pumpkin pie pumpkin mix and put in some chocolate chips. They were delicious! Hello! I'm interested in making these and am curious as to what size pumpkin can you used for the mix or if that even matters. Thank you for your time! Ellie she used a 15 oz can. It does matter what size because I accidentally used a 30 oz can and the texture was more like pumpkin pie. Still yummy, but I wanted muffins! Awesome recipe! Beyond easy and delish! I made these with Spice Cake mix and about 1/2 cup of semi-sweet chocolate chips and OMG, were they incredible! Not only was this the easiest recipe, it's also the most delicious, moist muffins I have ever had! And they are lower in calorie to boot! I am in Heaven and my whole family loved them (I say "loved" because they are already all gone and I just made them yesterday!) I am going to make more and bring them to work to share with my co-workers as a Fall treat. I am so happy I found this recipe! Thank you! I just finished baking these. (Yes, 11PM & I'm baking. I sometimes work the overnight shifts) They are FANTABULOUS!!! I topped them with cinnamon streusel and glaze. I'm bringing them to my guys at work- they enjoy being my baking test rats. Thanks for sharing this ridiculously easy recipe! Made these for the girls at work and they went wild for them. I put cream cheese icing on mine for more yummies;D thanks! I just made these with sugar free vanilla cake mix. Made one dozen with just the two ingredients and a little brown sugar sprinkled on top. The second dozen I add chocolate chips and walnuts. They didn't rise very well but they are tasty. I am a "Pinner", and tried this tonight, and we REALLY like these. I used a Carrot Cake mix: I did add eggs (as another comment suggested)and did cookies. I also added about three shakes of the cinnamon and ground ginger jars to the batter. I put the dollops on the cookies sheet for the first batch, and then added Butterscotch Chips with the second. I also put batter into two mini loaf pans so that we could have some slices. Those had to cook for about 35 minutes at 350 degrees...but they are GREAT. Would make great gifts too. Thanks so much for putting this out there. We're glad you did. Hello! Found this on Pinterest and am going to make them today! I had a yellow cake mix and chocolate icing already in my pantry! Hooray! I made these this morning and they were delicious!!! I was able to make about 20 good sized muffins from the mix. Thank you for the idea it's quick, easy, moist, and yummy I will definetly be making more! I made these over Thanksgiving. I first tried it with the deluxe moist Duncan Hines mix, but liked it better with the Betty Crocker mix instead...that might be because in that batch I also added some unsweetened applesauce (which made it perfectly moist) and some cinnamon. Topped them with cream cheese icing. YUMMY!!!! Easy to make, lacking flavor. I think if i made this again i would add pumpkin pie spice. How much pumpkin pie spice are you guys adding? I'm definitely not someone who can eyeball things like that. Help please! these were so easy and so yummy. hubby gobbled them up. i did add a pit of pumpkin pie spice, nutmeg and cinnamon to mine. not sure how much, i just dashed it in there to give it extra flavor. yummy. How many PP Points is one of these..they are yummy!! Nice Article! I hope this will be informative to all. Many have asked, but I'm not seeing an answer anywhere: how many cupcakes does this recipe yield? Are the posted calories 1/12th or 1/24th of the mix? 67 calories is amazingly low and I don't know if that is for a regular size muffin, or a mini muffin. How many weight watcher points are these? I made these last night but I used a larger can of pumpkin then recommended. Needles to say, they are SUPER moist. I'm not sure if they would still be ok to eat. I'm worried about eating uncooked/baked batter. Silly question? I tried these! :) They only took about 15 minutes to bake in my gas oven. Other than that the recipe was perfect and simple! I used sugar free cake mix so my 18m old could have some. He was in heaven! If I do this again I think I will make them in a bread pan to slice warm with a little butter. nomnomnom! Also, I Got 18 cupcakes out of mine. Noticed a few people asking. Just made these with Royal Vanilla cake mix, added chocolate chips and a few walnuts. Fabulous! I love this time of year, I get to have all the pumpkin I can cook. Thanks for the great idea, love it! I used a spice cake and the can of pumpkin and I did add 2 eggs. I put it in a cake pan. It is in the oven now. I will let you know how it turns out. Loved them but I added 1/2 tsp of pumpkin pie spice. They turned out wonderful. Don't have an oven so I put a little in a Dixie cup and put it in the microwave for about a minute and a half turned out great. My kids kept comming back for more. This is similar to a recipe I have, using spice cake mix, 1 egg, 1 cup pumpkin, and 2/3 c. water AND chocolate chips! But as this is cake mix (low nutritional value), these are really cupcakes, not muffins, which makes them not a healthy breakfast choice, Weight Watchers or not. I made this as a Pumpkin loaf today. It took 15 minutes more to cook and I also added 1tsp nutmeg 1tsp cinnamon 1/2tsp ginger to give it that pumpkin spice flavour. Everyone loved it! Can you freeze these? I want to make them tomorrow but my daughter won't be home from college until Thanksgiving. Do you think they will be ok in the freezer until then? I made these this morning, but used a carrot cake mix instead of the yellow one. Yummy! I opened a can of pumpkin puree instead of chicken broth by accident and decided to make these, did NOT come out as delicious as I anticipated. However, I did use a "moist supreme" cake mix and maybe that's why it was so dense. I Made These Lastnight With Devils Food Cake Mix, And Added Some Mini Choc chips. They Were Amazing!!! I Didnt Tell My Daughter There Was Pumpkin In Them Because She Never Would've Tried Them. She Loved Them!!! Best cupcakes Ever!! I just made this recipe and it's in the oven right now. I added 2 egg whites and I'm baking it in a cake pan like a regular cake for a turkey dinner party tonight. It should be interesting to see how it comes out. I made traditional buttercream frosting with butter, powdered sugar, vanilla creamer and pumpkin pie spice. I can't wait to see how it all tastes together! The cake still has a few minutes to go, but it already looks amazing. Just made these with french vanilla cake mix, I find that these are rather tasteless but they are good. Good for fiber and vitamin A( the pumpkin). Will be a great breakfast food for me. I have had this recipe on my pinterest board for well over a year and I am glad I made them. They burn easy on the bottom too, but nothing I can't get past. 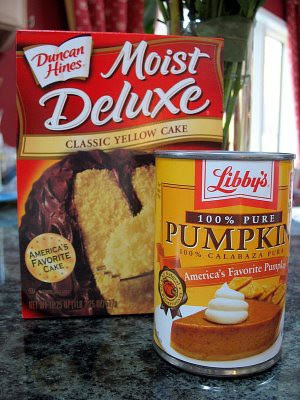 Can I ask why you can't use pumpkin pie filling in a can instead of just plain pumpkin? I gotta say this is one unique combination of flavors that seem to work so well. Love all the spices in these flavorful muffins. Swim team loved too. I love pumpkin muffins. I make pumpkin protein muffins all the time as an on the go breakfast. Instead of flour, I use oats and protein powder. I don't use butter or or sugar at all. I added mini chocolate chips. I think next time I will add pumpkin pie spice.